Why read work in translation? Even if Martí’s name doesn’t immediately ring a bell, there is more than a reasonable chance that you have heard at least a portion of his verse – particularly if you are over forty or fifty years old, or if you have ever studied Spanish in high school. If you are familiar with the folk song called “Guantanamera,” then you might know that its verses consist of a more-or-less random (and varied) sampling of stanzas from Martí’s poems. Growing up in the Sixties I heard the Smothers Brothers perform it on their variety show and have since heard it performed by Joan Baez and undoubtedly others. This edition contains a brief foreword by folk icon Pete Seeger who is principally responsible for the song’s diffusion beyond the Spanish-speaking world. While I am now retired from classroom teaching, I taught the song to my high-school Spanish classes for some twenty years (in southern Indiana) and even presented it, during my first year of teaching, to my English-as-a-Second-Language (ESL) students in Houston, Texas. If I didn’t fully grasp the power of those verses beforehand, I did after I had presented it to those mostly Mexican American students. Teaching in an urban junior high school was a kind of trial by fire for this slow-talking, slow-thinking Midwestern boy and to say that I encountered some discipline problems and youthful resistance would be an understatement. But when I played that song on my guitar, one of the boys who up to that point had tried me the most moved up beside me and listened with a rapt attention. Afterwards he went home and told his parents that, you know, that Mr. Sanders isn’t such a bad fellow after all, that he’s even surprisingly human. I wish I could say that with that gesture I was immediately transformed into another Jaime Escalante (super-teacher who inspired the movie Stand and Deliver), but that would be something of an overstatement. Still, the episode is illustrative of the power of Martí’s poetry to win hearts and move souls. To touch briefly on the question of Professor Fountain’s topic, it is a popular assumption that if you’ve seen one translation you’ve seen them all. Isn’t it just a matter of taking the precisely corresponding word in the second language and substituting it for the foreign word? To be brief, no. Even when both translators are competent and careful, differences will appear and each may convey a slightly different nuance, sometimes even a different interpretation altogether. The problem is worse when the translation is done hastily or without attention to detail: beware, in particular, translations found on the average Internet site, which may be particularly bad. That, of course, is a larger topic, and is perhaps best illustrated by other examples from the text, but the crucial educational point is that the translation / translator does / do matter. There are the good, the bad, and the ugly, and the best are objects to be treasured. For a closer look at the topic of literary translation I would recommend Lucina Schell’s excellent site at www.readingintranslation.com. Even if you aren’t a translator, you might learn something. I am a new visitor myself and have particularly enjoyed her essay on the art of the translator’s introduction. Anyway, as I was reading Martí’s brief prologue, it occurred to me that one important reason is that we need more perspectives on the world than the very limited and even myopic ones that we get from what passes as a national discourse on foreign and even domestic policy (immigration, anyone?). To broaden our perspective is to add to our “equipment for living,” to use Kenneth Burke’s phrase which is by now at least passingly familiar to readers of this blog. A person (or a people; or a nation) with only one perspective is sadly ill-equipped for the complexities of life in an increasingly interdependent world. 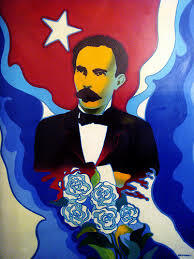 And who better to illustrate the principle, it occurred to me, than Martí, who is universally beloved and respected for his humane verses and struggle for freedom – and who, as a journalist who lived several years in the United States, was a perceptive and friendly interpreter of American affairs and life to his Latin American compatriots. Which is not to say that he was always an approving observer of gringo society and politics. It was with a worried heart over U.S. efforts to purchase Cuba from Spain, thus subverting to our own ends his people’s struggle for their own independence, that he accepted his doctor’s advice to take a vacation to New York’s Catskill Mountains where he wrote these poems full of reverence for his own land and people – this in 1890, five years before his dying in that struggle in an exchange of fire with Spanish troops. The allusion to Monterrey and Chapultepec is to the Mexican War which we fought between 1846 and 1848, during the Presidency of James K. Polk who was anxious to annex what are now our Western states by fair means or foul. As the Spanish American War turned out, while we didn’t get Cuba we did Puerto Rico, among other possessions. Certainly Martí had cause to worry, since our motives and interests were clearly not of a wholly altruistic nature. Now, today we may argue that those Western states are much better off than had they continued belonging to troubled Mexico. Though it should be noted that one of our most fiercely independent-minded American writers of the day, Henry David Thoreau, wrote his famous essay “On the Duty of Civil Disobedience” in protest of that war which he rightly saw as a war of American aggression against a weaker neighbor – and he went proudly to jail for refusing to pay his war tax. And while we may argue that Cuba would have been better off with us than under the rule, first, of the tyrant Batista, and then of the Communist tyrant Castro, we will never know how the extremes of Castro’s rule might have been moderated if his movement hadn’t from the outset been threatened by the out-sized power and bellicose threats of its neighbor to the north, who even tried to assassinate him. Regardless of how individually we might feel about those questions, to me it seems inarguably true that we can scarcely have a meaningful and productive dialogue with other nations or people if it has never even occurred to us that they might view things from a different perspective than we do. And that they might not always look kindly on our efforts, whether real or perceived, to enforce our will on them by military or economic fiat. And (gasp!) that they might have a point: that we could even be wrong, now and then. None of which is to argue that the United States is the Great Satan, but it could certainly do us good to have a better sense of how the rest of the world perceives us – often for good, but sometimes not so much so. And not without reason, more often than many of us care to admit. Thus, I would argue, one very practical reason for reading in translation. It equips us to live better and more wisely in a world of varying perspectives, no one of them wholly valid in isolation. Not even ours. 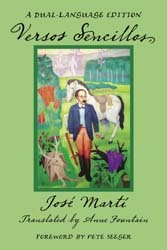 Of course, another reason for reading Martí in translation is for the same reason that people have read and loved him throughout the Spanish-speaking world for over a century: for the sheer pleasure of it, which (with the related concept of beauty) is its own kind of equipment for confronting the sometimes cruel vicissitudes of life. Martí himself, for instance, speaks in one of these poems of the “sweet consolation of verse” (dulce consuelo); and in another he writes, as Professor Fountain translates: “You, poem, are the poet’s friend” – and likewise the reader’s, I like to think. I must tell you that, if you are looking to explore these verses on your own, the McFarland edition may seem a bit over-priced at just under $40 for the paper edition. This was also the case when some years ago I purchased my friend Julie Sellers’s delightful book Merengue and Dominican Identity: Music as National Unifier. McFarland does have an impressive list and bills itself as “a leading independent publisher of academic and nonfiction books,” so I suppose their marketing plan is aimed at universities and libraries and that they are thus able to take on projects that would otherwise be cost prohibitive. If you can’t buy it for yourself, anyway, you might suggest that your local library purchase it. 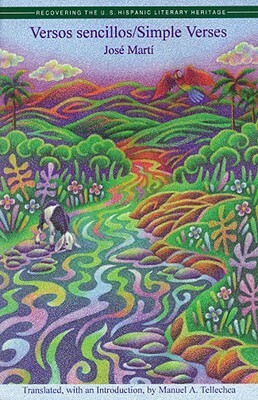 But also there is another edition from the Arte Público Press, by the Cuban American translator Manuel A. Tellechea, that is aimed at young readers and much more modestly priced. I do not have that version available and have not made a comparative study of the translations, though I am familiar with the press and it is extremely reputable.